...just minus that shiny guy. Ya know, since they already have one Superboy villain on the team, why not make it two? 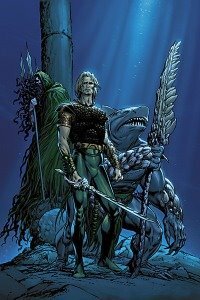 Are you comparing the the pretender to Namor?! The Defenders was great stuff. Ruby Thursday? The Six-Fingered Hand? Elf with a Gun? Genius, my good man. Genius. Sword of Atlantis ain't too bad either. Could stand to have a gun-toting elf in it, though.